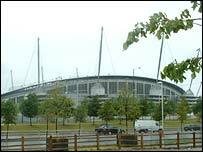 Manchester City FC has signed up to a scheme to help it attract more gay fans and staff. The club has paid a four-figure sum to join the Diversity Champions scheme, run by gay rights group Stonewall. It is the first professional club to join the scheme, which focuses on a range of gay-friendly initiatives. The club said it wanted to send a welcoming message to gay, lesbian and bisexual supporters, be inclusive and be a progressive employer. Stonewall chief executive Ben Summerskill described Man City’s decision as a "significant step" for English football. He said: "Manchester City should be congratulated for putting their head above the parapet and moving into the 21st century." In the next few weeks, the organisation will be looking at specific areas to target and work on with the club. Mr Summerskill said: "The work can range from looking at recruitment processes to what’s already going on in the workplace, to developing marketing strategies. "It is mainly about Manchester City wanting to be an exemplary employer." Mr Summerskill said he believed that a more gay-friendly environment would attract more straight fans, as well as homosexuals, because families were more likely to attend an atmosphere free from homophobic abuse. He added: "If we help to get the club more supporters, more money and better staff, then they will have better training, better facilities, and it is all part of a virtuous circle of success."